I’m dubious about this. 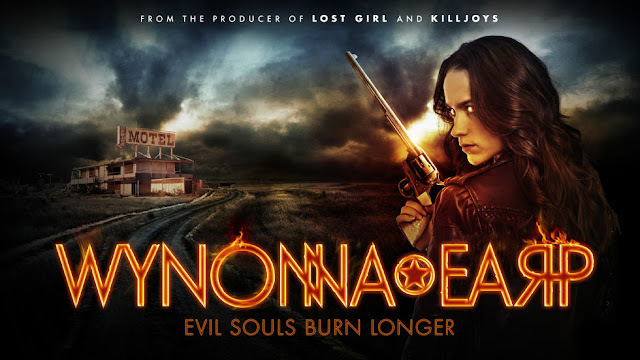 Sure I can see them wanting some results, but is it just Wynonna’s gun that leaves no trace? Because tangible evidence of woo-woo must, by definition, be hard to find. And what do they think he’s doing? Making up stuff so he can continue an extended holiday in the arse-end of America? Is it not worth keeping 1 agent there since that agent insists something is going on? Unable to present evidence, he ominously mentions something which isn’t revenant or demon which should interest them. That could be Wynonna, Doc or the Stone Witch Constance. Since Waverley is having a part, Wynonna and Nicole Haught are left to get drunk and complain about not being invited (as well as reflect rather obviously on Waverley’s character development) while looking at the latest case in hunting down the last member of the seven. This introduces the new pathologist (who is kind of fun and creepy), lots of ominous foreshadowing for the revenant and the fact he keeps playing with Wynonna, trying to freak her out. Including random nose bleeds. Nicole definitely knows something is going on and Wynonna tries to drive her away, which is a shame because they’re really good together. Waverley’s party is going pretty terribly since most of her friends won’t come to the “murder house” and one of the two who did turn up turns out to be a terrible terrible person. Wynonna and Nicole’s insight that Waverley goes out of her way to appeal to the people around her even when they’re terrible terrible people. But not before the Blacksmith, dying, manages to tagger to Doc and tell him Constance’s weakness… but she wants him to promise to get Waverley safe first. Because they’re going to need to – as both Nicole and Wynonna appear to have been kidnapped, just as Wynonna was going to tell Nicole everything. Don’t you kill Nicole, Wynonna Earp, don’t do it!